Gold glitter dice, flocked dice tray, leatherette dice cup, giant scoring chips. A real treat for YAHTZEE connoisseurs! 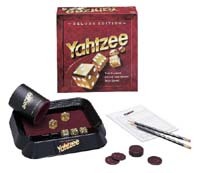 Other products in the "Yahtzee" series.